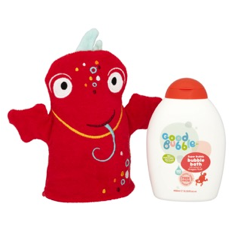 Good Bubble make natural and fun bath stuff to get you squeaky clean and open you and your family up to some new discoveries too. From the superfruits that take pride of place in our bottles, to their journey from far away lands and the way it’s all put together at a family business in the heart of England. We bring you gorgeous, gentle formulations that truly nourish your hair and skin. Rich in nutrients, free from harsh chemicals and kind to the planet. Made with only the best intentions. No tears. No nasties. Good Bubble are giving my readers a chance to win one of their gift sets. There will be two winners. 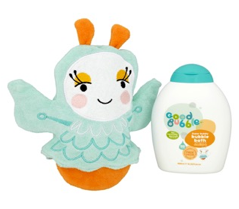 One person will win the Clara set which contains a cloud berry bubble bath and cute bath mitt. The other winner will win a Dexter set which includes a dragon fruit bubble bath and cute bath mitt. My grandson loves bath time. My son and daughter both love the bath. our little Grandson loves it, more bath toys than water, but he has fun! My children loves bathtime especially the bubbles! Absolutely adores it - would live in the bath if possible! My youngest is only 6 weeks but seems to love bath time, my other two boys loved it too! Yes, they both love it and never want to get out!! Yes my kids love bath time. Thanks for this lovely giveaway. My niece loves 'swimming' in the bath. They all do yes! They love it! yes - they seem to always soak the bathroom !